The 412 MW Rampur Hydroelectric Project is located near Rampur in Himachal Pradesh on the river Satluj. This run-of-river was first proposed by the Government of India in 2004. The project was granted environment clearance by the Ministry of Environment, Forest and Climate Change (MoEFCC) in 2004. Rampur HEP is a public sector venture being executed under the aegis of Satluj Jal Vidyut Nigam Limited (SJVNL). The company has under execution 10 more hydropower projects in Nepal, Bhutan, Arunachal Pradesh, Manipur, Uttarakhand and Himachal Pradesh and aims to tap 6,000 MW by 2020. The Rampur project is designed as a cascade run of the river plant and will not draw out any water from the river but from the tailrace of Nathpa Jhakri project. NP also owned and operated by SJVNL, and is also one of several mega dam projects in the state. 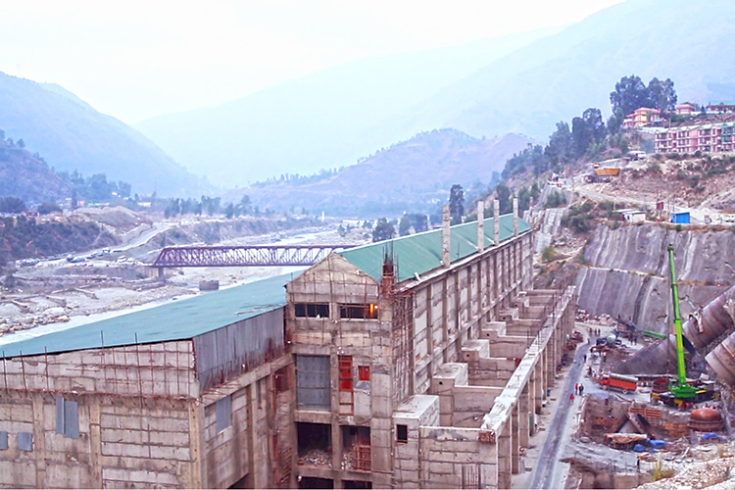 In the year 2007, Rampur HEP received funds from the International Bank For Reconstruction And Development for US$ 400 million, while the total cost will be US$ 670 million (1). The Rampur project has been the Bank’s first step in its re-engagement in the hydropower sector in India after more than ten years of shying away from funding water infrastructure projects in the country (after the Sardar Sarovar Dam). It was much later in 2012 that the project was registered as a CDM project and is a part of the World Bank fund, Umbrella Carbon Facility Tranche 2. The Swedish Energy Agency has issued a letter of approval, but without applying the World Commission of Dams (WCD) criteria, violating the EU Linking Directive (2-3). Over the next 10 years, Rampur HEP is expected to generate about 14 million carbon credits at an estimated market value of $100 million USD even while the projects’ additionality remains questionable, according to Carbon Market Watch (4). They also claim that many of the additionality concerns of the project cannot be further investigated because one of the key documents, the investment analysis, is not publicly available. On top of that, the decision to finance the project had been taken long before the CDM was created; a cable released in 2011 by Wikileaks and sent by the US Consulate in Mumbai, even candidly states that Indian CDM projects do not depend on CDM funding and are therefore additionality is not valid (5-6). The Memorandum of Understanding (MoU) was signed between Government of India (GoI) and Government of Himachal Pradesh (GoHP) in October 2004. The Implementation Agreement between SJVNL and Himachal Pradesh State Electricity Board (HPSEB) was signed on 20th October 2004. In December 2005, the project was accorded the Techno Economic Clearance. The environment clearance was granted by the Ministry of Environment, Forests and Climate Change (MoEFCC) on 31st March 2006. The Forest Clearance for diversion of 69.3762 ha was granted by the Forest Advisory Committee on 7th April 2006. Local communities and national experts and analysts, as well as international and national Ejos have strongly critiqued the project on several fronts. That local inhabitants were not heard nor consulted about the plant construction, compensation measures were not negotiated with affected people and in most of the cases not properly applied. In unison with other projects like 1200 MW Karcham Wangtoo Project and Nathpa Jhakri, there have been clear evidences of impacts like drying up of natural water springs, loss of agricultural/horticultural productivity and damage to houses due to heavy blasting. A report of the Panel of Environmental and Social Experts appointed by the Directorate of Energy, Himachal Pradesh to study the Satluj basin hydropower projects too speaks on the rickety picture on ground; antithetical to the usual victorious narratives of the World Bank. The report mentions about local population dealing with the illegal muck dumping issue, the inability of SJVNL to fix the approach roads and connecting roads. In Duttanagar in specific, the locals complained of rising noise pollution, dust emanation from construction activities, in turn reducing the farm yield by disrupting the pollination process. (10) According to SANDRP, the Environmental Impact Assessment lacks reliable data (7). It was also revealed that there were numerous problems concerning health and safety, as well as the working conditions of the many migrant workers who are temporary employees (8). International Rivers and SANDRP also point out that the rationale for the project needs to be challenged as the project does not produce peaking power, which is the most needed electricity in India (9). Project Details The plant's capacity is 412 MW. 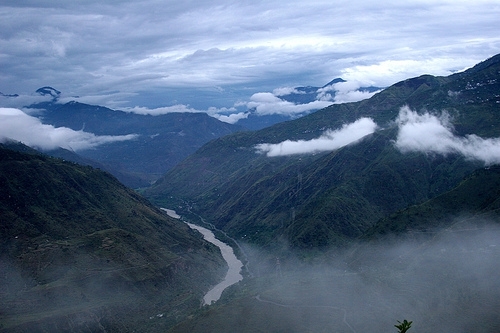 The project is designed to use water as it leaves the Nathpa Jhakri Hydropower Project. The water is passed down a 15 km head race tunnel with 10.5 meters diameter to the Rampur powerhouse, where it will generate approximately 1,770 million units of electricity a year (World Bank) The generated power will be exported to different states under the NEWNE Grid2 as per the power purchase agreement between the states and the project promoter. The RHEP project consists of six turbine generators, each having a rated capacity of 68.67 MW. The project does not require construction of a dam, reservoir capacity or additional land inundation. About the CDM, all opponents agree on the fact that such projects should not be considered additional and therefore do not have the basic requirements for being registered as CDM projects. • Large Hydro projects of this capacity must no longer receive CDM support. • Indian projects that are under investigation by the national Green Tribunal must have the LoA, removed by the Designated National Authority until due process is complete. Local inhabitants claim their compensation rights and also that a minimum and vital amount of water should be released, according to the Indian environmental law. Why? Explain briefly. Despite national and international mobilization, the construction of the plant is still ongoing and it is still registered as a CDM project. It states: The resettlement impacts are very moderate, but it will be necessary to devise an appropriate resettlement package in consultation with the affected persons. The project requires about 81 hectares of land, out of which, 32 hectares is private land and the balance is government owned forest-land. It is provisionally estimated that about 215 title-holders will be affected as a result of private land acquisition, and about 20 families will be physically displaced.